I’ve been using digital ocean for a couple of years for my own business and for some clients. 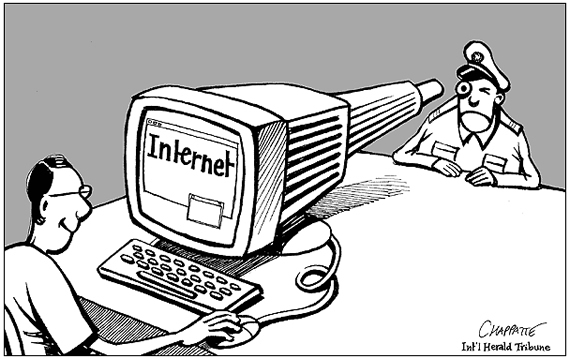 A few months back I started a new personal account with a privacy focus to run my own VPN etc. * Social network (twitter, facebook etc). Really?, my facebook and blog? This seemed very intrusive to me. My credit card authorization is proof of who I am. When moving the post office uses a credit card to verify who you are. So if it is good enough for the US Government, why not digital ocean? Although it gave me an icky feeling, I complied with their request. It seemed overly intrusive but it was late and I wanted to get back to real work. Really? In addition to my social networking sites you need my drivers license too? Digial Ocean is now trying to collect more information than my bank. Who are these people? If they had simply asked for my drivers license to begin with I would have complied. But they feel they need my social networking sites too? I would worry when your ISP wants more information the the federal government or your bank for “identity verification”. I have now moved all my services to http://www.ramnode.com/. So far my experience with Ramnode has bee excelent. And now I have ruby 1.9 and openssl 1.0.1c talking to facebook without peer resets. I’ve been meaning to attend a rails conference and after moving to Oahu I figured it would be a while. But now the Rails conference is coming to me! So I couldn’t pass and will be at Aloha on Rails. Announcing MongooseDaemon, an objective-c wrapper for the wonderful mongoose http server. It can be indispensable to be able to explore your iPhone apps directory structure when developing and debugging iPhone applications. You may also want to serve up content from your iPhone application via http. Erica Sadun’s cookbook has an example of a hand rolled http server. However, it is only an example and is incomplete. I recently needed a http server in an iPhone app and after playing with Erica’s example I quickly realized I didn’t want to be in the business of creating a complete http server. So I started looking for an existing http server I could embed in my app. I quickly found moongoose. With just a few minutes of coding, I was able to get mongoose working in my iPhone application. To make it even easier for the next developer, I extracted my wrapper into the MongooseDaemon class and am offering it under a BSD license. Serve files in good health! I’m pleased to give you ratos, a shell to speed iPhone development by decoding an entire stack trace at once using atos. Of course as it relies on atos, so it only works on a Mac with Xcode installed. Paste xcode stack trace to stdin, then type 'sim' or 'arm' on a line by itself. Type 'exit' or '^D' to quit and 'app' to print the current app. When I first learned iPhone development it took me a while to find atos. Exception handling comes natural but Xcode spits out addresses in their stack traces. After much googling I finally found atos. I then immediately found Apple’s docs to integrate atos into an exception handler. Cool….NOT! Turns out Apple’s Xcode integration relies on /usr/bin/atos at runtime….not possible on my iPhone. So, I immediately wrote a quick and dirty shell in Ruby that takes a stack trace in from xcode, and prints out any lines that have symbols. Gobbledygook in, nice human readable stack trace out! After enjoying ratos for the past few months I finally had a chance today to clean it up a little and publish it on github. 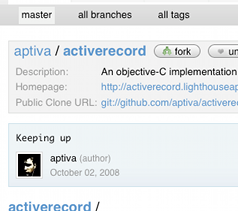 I used objective-c activerecord in IttyBooks as my ORM layer. I fixed some bugs and made some API changes. Most of the API changes where for performance or memory reasons. While activerecord is not as feature complete as its Ruby cousin, it was nice to contribute. Sure beats mixing SQL in objective-c as well. Anyway, you can view all of my changes on my fork at github. And they should end up merged back in aptiva’s master tree as well. Been busy writing iPhone apps full time these days. Here are a couple of the apps I’ve recently written. 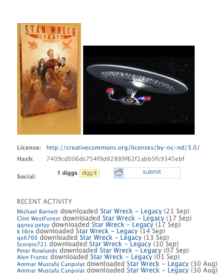 We have extracted ActivityStreams from Legaltorrents.com and released it under the BSD license. This is a new plugin for the Rails Community that provides a customizable framework for cataloging and publishing user activity and social objects. We currently aim to provide support for microformats in HTML, Atom feeds, and compatibility with the open source DISO social networking implementation for activity discovery and consumption. For further documentation here is the rdoc and the AcitivityStreams Home Page, or just show me the code. Thanks to Ruby on Rails, transferring and converting database from one database platform to another only takes a few lines of code. There are rake tasks for dumping to YAML and back. However the existing YAML scripts I found had issues with some of our data and then failed for blobs. This script will only work with a “rails style” database. By “rails style” I mean any database where every table has a unique key named “id”. A special thanks to Matson Systems, Inc. for having me write this script for LegalTorrents and then contribute it to all under a BSD license. Ok, let’s get the rake task and run it. Running the rake task may take a long time. You should now have a copy of the production data in the development database. Update Oct 1, 2008:Fixed a bug today for Rails 2.1.1. Also got rid of the hash of data that was a relic from an early version of the script that used a single model object. # WARNING 2: This script assumes it is the only user updating either database. #                     writing to the databases. # Copyright (c) 2008, Matson Systems, Inc. All rights reserved. #   documentation and/or other materials provided with the distribution. # PAGE_SIZE is the number of rows updated in a single transaction. As some of you know I’ve been working full time for Matson Systems, Inc. building out LegalTorrents. I must apologize I have been neglecting parts of my blog. 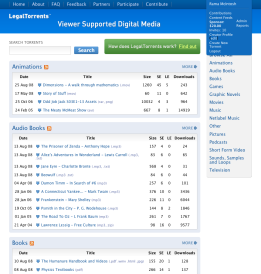 Fortunately, I’ve been swamped building out cool features for LegalTorrents and Matson wants to contribute back. After this caching article look for a rake task to convert a Rails app from one database platform to another, then a plugin for generating Activity Streams. As a new community, we have to support tens of thousands of registered users. Yet on any given news day we need to support hundreds of thousands of non registered users. This can be done using action caching and very modest hardware requirements. Given huge hardware resources, using memcached would solve the issue. However, meeting initial demands can be done using action caching with very modest hardware requirements. We use the built-in rails action caching to disk with a TTL hack from cron. We don’t want our logged-in users subjected to a TTL, as their changes should be instantaneous. We simply don’t cache actions for users who are logged in, and provide cached pages for everyone else. As the number of registered users grows… then we’ll use memcached. # of course logged_in? needs to be defined...restful_authentication is what I recommend. @@perform_caching && !logged_in? && flash.empty? Safari can’t open the page. Safari can’t open the page “http://www.apple.com/”. The error was: “unknown error” (NSURLErrorDomain:-1) Please choose Report Bugs to Apple from the Safari menu, note the error number, and describe what you did before you saw this message. After fiddling with it for a few minutes I found a solution. The iphone appeard to be still trying to using the WiFi connection and not 3G. So, right before the final step of launching NetShare on the iphone (i.e. after setting up the adHoc network on the iphone to your PC), launch Safari on the iPhone and surf to a page. This will cause the little WiFi icon to change to 3G at the top of your phone. Now lanuch NetShare that you have the 3G icon back and everything will work like a dream. Have iPhone, Have Laptop, will travel!